We offer same day local delivery on all orders received by 2.00pm. For orders outside a 25 mile radius of Canterbury a courier charge of £9.95 will be added to each order and we offer next day national delivery on these orders , our bouquets are skilfully designed by ourselves and sent in tissue lined boxes by specialised courier. If you have an urgent order please call the shop where we will do our best to accommodate you. Deliveries are not available on Sundays and Bank holidays. At peak times such as Christmas, Valentines and Mother’s day due to the volume of orders we send by courier, flowers that are being sent further than the 25 mile radius of our shops and as we are aware of how important it is to receive your flowers in tip top condition and in good time, flowers may be dispatched up to 24 hours earlier than the requested delivery date. We are sure that you appreciate that the quality and freshness is the most important factor, we share the same passion with you, and the recipient will appreciate this too. 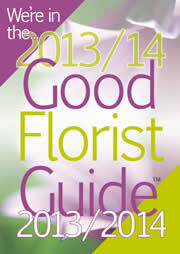 We are passionate about our flowers and our business and are totally committed to ensuring the best in floristry. We value your custom and your comments, if at any time you are not completely happy we need to know about it! We are here to help and value your comments, if for any reason you are unhappy with your flowers, please let us know within 48 hrs. and we will replace or refund your bouquet, as we understand - like humans, flowers are living things and do sometimes have an off day! If you wish to change your order, please do so by calling 01227 713232 or by emailing sales@contemporaryflowers.co.uk please not that any changes made to your order must be made at least 48 hours prior to despatch. We cannot guarantee to accept changes made after this time. Our website has a secure checkout and we therefore encourage customers to place their orders online. However, on occasion, when submitting customer's credit/debit card details to our bank, we receive payment failures which prevent us from accepting your order immediately. Under the normal circumstances we attempt to deliver to the address that is provided and the date that it is requested. However, there are times when this is not possible due to problems with the address information that our customers provide or due to problems our drivers encounter when attempting to deliver the order. It is essential that you ensure that the recipient address you provide is accurate and that you give additional instructions to assist our drivers locate difficult-to-find addresses. Arrange for another bouquet to be delivered the next day or you can have a full refund.